Who bears the tax burden? While citizens have to pay taxes, most countries in Europe let wealthy multinational corporations get away with dodging billions of euros. After years of pressure from people like us, the EU started to consider whether to force multinational corporations to be transparent about how much tax they pay. When corporations put all their lobbying power against this, we decided we had to be stronger than them and brought together more than 110,000 Europeans ready to take action. We went to the European Parliament and also addressed the Council to let them know thousands of Europeans demand tax justice. While this petition is now closed you can still act for tax justice: help us stop corporations using profit-shifting to avoid paying taxes! The scandalous accounting tricks being used by multinational corporations to shift their revenue to wherever taxes are lowest, is costing all of us billions. This has to end. As a minimum first step, we ask that corporations are made to publicly declare how much they pay in taxes and what business activities they carry out in each country where they operate. We likely pay more tax than wealthy corporations. Google for example paid less than 3% in taxes over the past years using legal loopholes in Ireland . Belgium recently allowed around 35 big corporations to use more loopholes in order to avoid paying 700 million euros in taxes . While citizens have to pay taxes, most countries in Europe let wealthy multinational corporations get away with dodging billions of euros. Conservative estimates show this actually costs Europeans between €50 to €70 billion every year. . The European Union is now looking into forcing corporations to be transparent about how much tax they pay. That way everyone can see if they have tried to hide profits and how much they actually owe. But corporations are fighting hard to water it down, to the point where it’s useless in the fight against tax dodging. If the final directive ends up with the type of reporting corporations’ want, we would get weak data that wouldn’t reveal whether corporations are engaged in aggressive tax planning and profit shifting, and we’d get it from fewer than 15% of all companies. It would mean that corporations and wealthy individuals can simply shift their profits to tax havens outside the EU and continue to dodge tax. If the Commission and the Council side with the European people it will show they are serious about providing solutions by cracking down on corporate tax dodging. Siding with us means ensuring the proposal has teeth. It means all companies in the EU are obliged to report publicly, no matter where their headquarters are; that they report on their activities in all countries, not just EU countries; and that 85% of companies are not exempted from reporting. This petition is run in partnership with the European Network on Debt and Development. Bringing transparency to corporate tax policy in the EU. Steuern zu umgehen ist, ebenso wie die Tatsache, dass viele Länder dazu anlocken (Steuerparadise), eine absolute Missachtung der weltweiten Gesellschaft. Unternehmen sollten Steuern zahlen um auch die Infrastruktur mitzufinanzieren, die sie im erheblichen Maße nutzen. Our LIVE matters to Us !!! People are suffering horrendously because of corporate greed. If this is your first action with us you will soon receive a thank you email asking you to confirm your email. We add this step in order to make sure it was actually you who used your email to sign the petition. Do you know anyone who also feels strongly about making sure big companies pay their fair share in taxes? Why not send them an email asking them to sign the petition! Apple has been caught dodging billions in tax and the European Commission has ruled they should pay €13 billion. 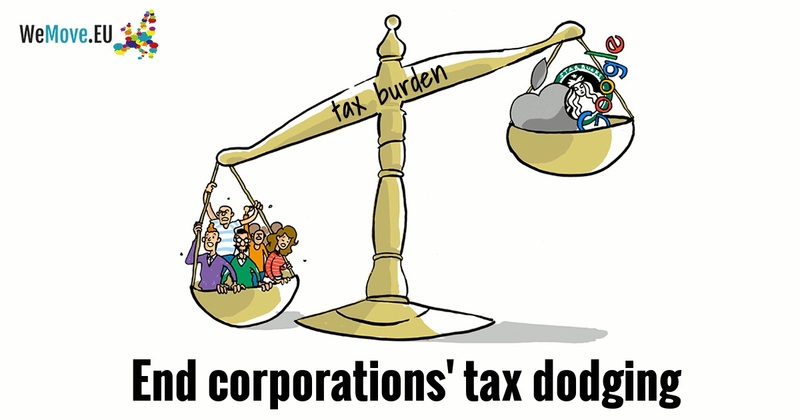 This is great but there are many more cases of corporations dodging tax that go unnoticed. We need stricter rules that force corporations to be transparent about how much tax they pay. Join 9973rd of Europeans - SIGN the petition for tax justice now! Thank you for standing up to multinational corporations with us. It is only together that we can truly be a force to be reckoned with. WeMove.EU is funded by donations from our community across Europe. Can you chip in to help make of Europe a place of better democracy?